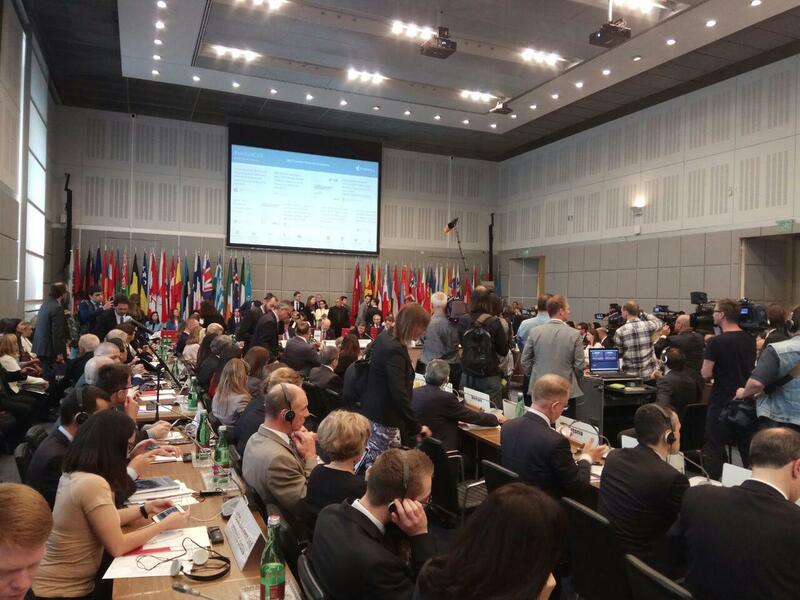 ​​In Vienna, the capital of Austria, on May 25, the Conference concluded: “Preventing and Countering Violent Extremism and Radicalization that Lead to Terrorism”. Participants of the Conference spoke for three days about their experience in counteracting the radicalization of society, especially young people. It was interesting to listen to experts from the OSCE participating countries who told how it is possible to fight extremism, recruit recruitment, rehabilitate former militants and much more, which in the end should help in the fight against terrorism. The Conference started its work the day after the resonant terrorist attack in Manchester. Almost all participants of the Conference who made presentations recalled the victims and expressed condolences from the delegation from Great Britain But for one question, which all the time arises immediately after another terrorist act, I never received an answer. What, after all, do the DAISShvtsi achieve in Europe, with an enviable regularity of organizing or ideologically supporting, conducted terrorist attacks against civilians? And I mean not ordinary performers, but ideologues of the Caliphate, who are well aware of the goals that they set themselves and the tasks that they are to solve. It is clear that one of the goals of the ideologists of the Institute is the expansion of spheres of influence in new territories, proclaimed by them the Caliphate. To achieve this goal, the leaders of the Caliphate need to solve the main task — to try to radicalize as much as possible the Islamic population, including in Europe. The result of such a terrible, by its results, activities is gradually growing in European society hatred of Muslims. Whatever liberal-minded politicians are saying about the tolerance of the European model of democracy, anti-Islamic sentiments in the EU countries are becoming increasingly popular. Proof of this is the growing popularity of the right in the European Union, which to some extent use anti-Islamic rhetoric. «Efforts» that are being undertaken by governments, special services, civil society institutions in the Western world indicate that terrorist attacks in these countries will continue, and with them the unfair hatred of Europeans towards Muslims and the religion of Islam will grow. The more terrorist acts will be carried out, the deeper will be the hatred for strangers, the hatred that will dissolve Western society, not only socially, but also religiously on different sides. This situation will turn Muslims living in Europe today into outcasts. Radicalize the rogue is a very simple task, which emissaries in Europe and so well decide. What can be countered by such a strategy of the leaders of the DAIS? Participants in the Conference offer various mechanisms to prevent the radicalization of society, especially youth, the rehabilitation of former militants or convicted radicals. However, the numerous contradictions that exist between the countries, including OSCE participants, the absence of a unified program for countering terrorism and cooperation between the special services, do not inspire optimism in the effective struggle against the radicalization of citizens, especially the Muslim community of Europe. This means that after some time in Europe there will be a situation when extremists will be able to put under the gun an entire army of outcasts. Where will this army start a jihad against the infidels, the Middle East or Europe itself? Someone considers this question rhetorical. The recommendations of some experts somehow to stop the outcome of Muslims from the zones of military operations in the Middle East and North Africa look utopian. Well, who today from the leaders of European states will agree to spend huge financial resources for rebuilding the absolutely destroyed economies of Syria, Iraq, Afghanistan, Ethiopia, Yemen, Somalia, creating decent living conditions for local residents from conflict zones to stop the flow of refugees in European countries? Further combat actions (which are inevitable today) in these regions will only increase the radicalization of young people, forced to leave their native places in search of a safer life in Europe. No less utopian is the proposal — to socialize and adapt refugees to normal life in EU countries in accordance with local standards. And even if such an adaptation happens (which is highly doubtful), then there is no guarantee that the representatives of the second generation of refugees will not become jihad wars and terrorists in Europe, blowing up civilians, that sheltered their countries. The real facts show that most of the terrorist acts in Europe were committed by members of families of immigrants from the Middle East, North Africa, the second and third generation. An even worse situation with the radicalization of the Muslim population is in the areas where there is a clearing of places, (for example, Mosul), where the terrorist detachments of the DPAH are knocked out. Sweeps of the territory with civilians (who lived «under the heel» of the DAIS), the liberators spend in such a harsh regime that the total radicalization of the unfortunate is quite natural. Therefore, the replenishment of the troops of the soldiers of the Caliphate by recruits from this region is natural and will continue all the time. The question which has plunged into all this arises, and what do you do in all this? I have not heard from more than 500 experts from the OSCE participating countries.